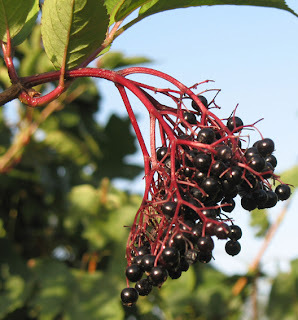 Here are some pictures - mainly of flora - I took in Wandlebury - one of the few hilly locations in Cambridgeshire! 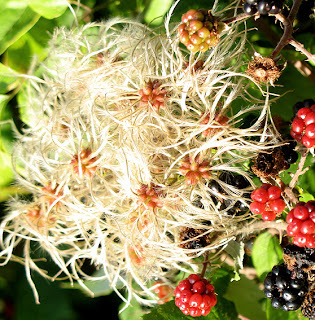 Alison thinks the fluffy stuff may be Old Man's Beard. 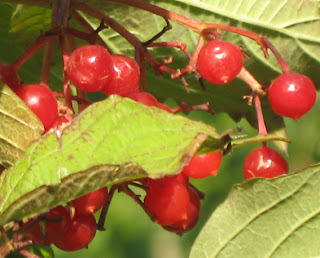 Red Berries - not sure what they are. If you do, please let me know. 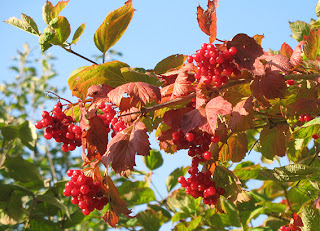 Again, thank you Alison, I think you may be right that this is indeed Guelder Rose. 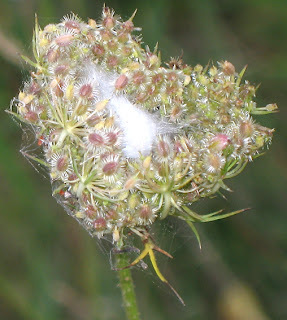 There seems to be a spider's nest or a cocoon in this one. 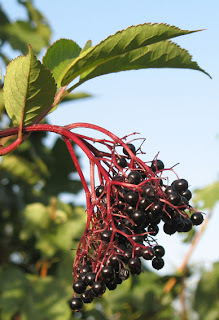 Not sure what it is though. 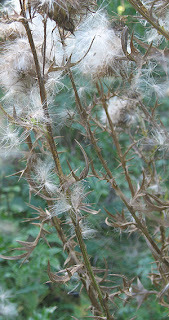 Doesn't seem to be a thistle as the one below. Very architectural, a bit like a chives plant. 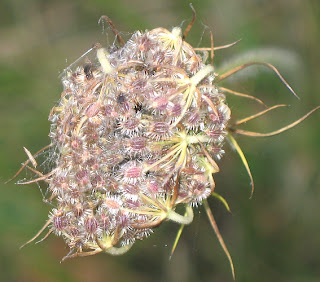 This one does indeed look like a creeping thistle, thanks again, Alison. Note: Please feel free to use these photos as reference images, however do not use them commercially or copy them without asking first. This is a new mini series - all about the trips I went on last year. 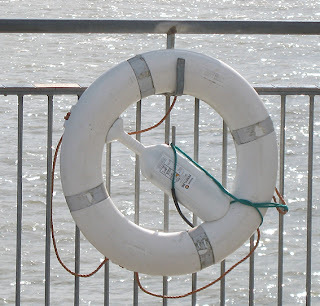 The first one to be recounted here was to Southwold at the end of August. 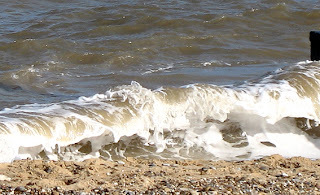 I had my trusty camera with me and, of course, took a lot of pictures whilst collecting sea glass. 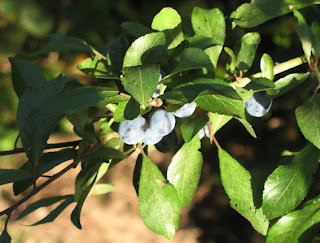 Here are (what I think) my best pictures. 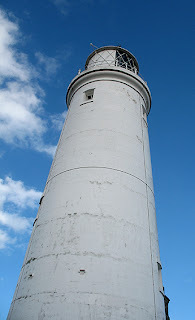 The first one is of the lighthouse. 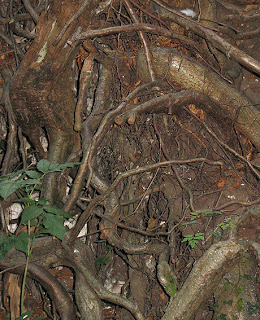 I am pleased with the picture because it shows how high the thing really is! And I spent even longer getting this one just how I wanted it. 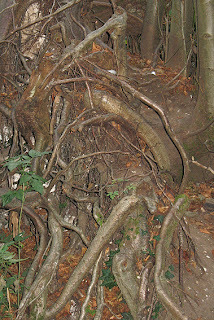 This is quite tame compared to the other two, but I liked it because it looked like some giant creature's tail (a dragon?) 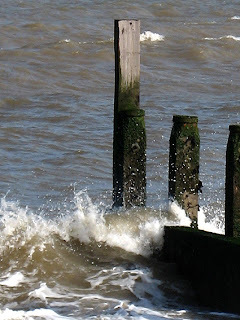 dipping it's tail in the sea. 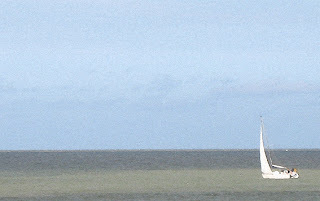 And here's one of a series of pictures I took of the sea and the boat. I messed around with it in Photoshop to give it this painterly feel. I received some gorgeous forged copper and sterling silver findings on Friday from one of the many Etsy shops: E2SSupplies.etsy.com. I love the rosy glow of the copper as shown in the set below. 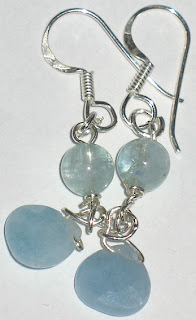 More Chalcedony, this time teamed up with beautiful handmade sterling silver ear wires. All findings are also sterling silver. 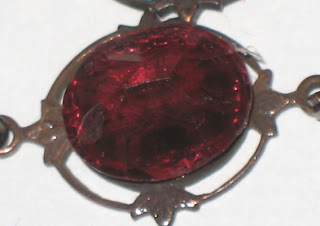 Again, the flash seems to have an odd effect on the chalcedony. I love the simplicity of these earrings. These earrings are MINE. :-) I've used oxidised and polished sterling silver ear wires, vintage black enamelled chain with very unusual green garnet faceted squares. 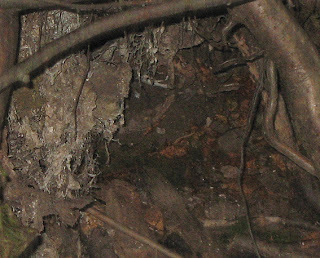 One set of garnet has black inclusions, the other is pale as ice. 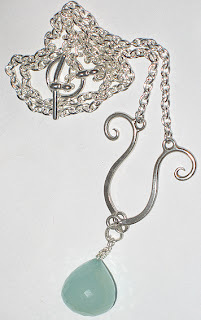 I love the contrast between the oxidised/polished silver, the black chain and the two types of green garnet. Very Art Deco I thought. Below are a few pieces that haven't been finished - stations and pendants. I thought some of you might like to see this 'work-in-progress'. This is a peacock coloured vintage cabochon set in gingerbread coloured vintage filigree. I have made four of these (I only managed to get hold of four of the cabochons). Not quite sure what I'll make with these. Possibly a bracelet or maybe a necklace and earring set. We'll see. Watch this space. 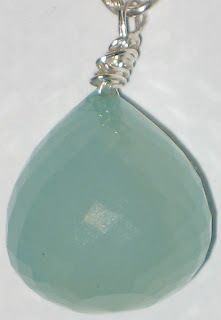 This pendant was made with a vintage bezel setting and sparkly blue vintage (glass) faceted cabochons. 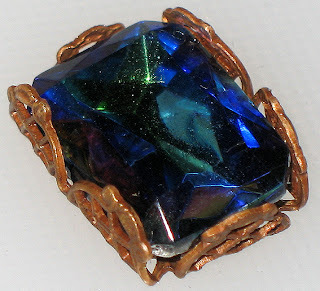 I think this would be lovely as a pendant, but since it is quite small it needs something extra. I might team it up with a butterfly or a dragonfly to make it into something more interesting. The next one is a simple copper-wrapped rock quartz pendant. 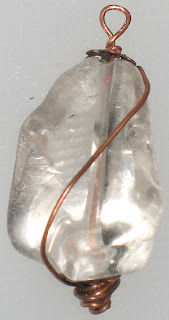 The rock quartz is quite a big nugget and I love the icy quality of it combined with the warm copper wire. 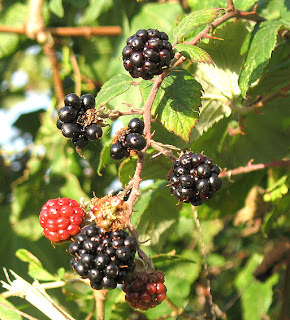 We'll see what I am going to do with it. 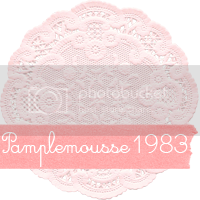 I particularly like the next pendant. It's made again with a rock quartz nugget, but this time wrapped with brass wire (with a nice patina), a filigree bead (at the top), a vintage spiral dangle at the bottom through which I've threaded a bit of chain with Magatama drops in AB crystal, AB grey, and frosted grey. The whole pendant looks like dripping ice. 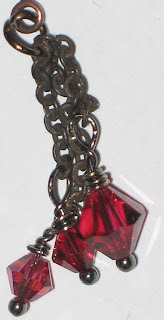 I think it will look great on a simple, fairly short chain with the pendant dripping down the front. 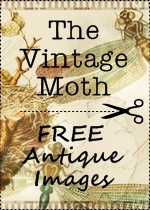 I've been having fun with all the goodies I got from the Vintage Beadshop on Etsy. I got the most wonderful bits and pieces, some of which can be seen below (and here). All of the earrings with the exception of the Scarlet earrings will be available in my Etsy shop soon. The deep red of the vintage cabochons I've used here is so passionate and slightly sinister on top of the vintage connectors that Jezebel seemed the perfect name for the earrings, especially when teemed up with the dark red Swarovski bicones and the dark patina of the vintage chain I've used. Rather than using brass findings I ended up using gun metal as this went better with the patina of the vintage chain and connectors. 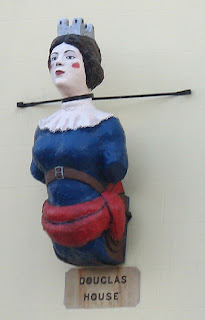 From Jezebel it wasn't far to the Scarlet Woman. Hence the name for this pair of earrings. 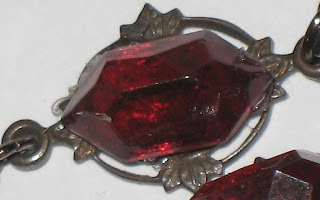 The connectors and cabochons are slightly larger, the cabochons more of a scarlet red. 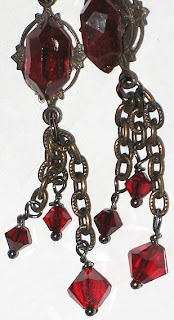 The design is very similar with more Swarovski and Czech bicones in scarlets and deep ruby. 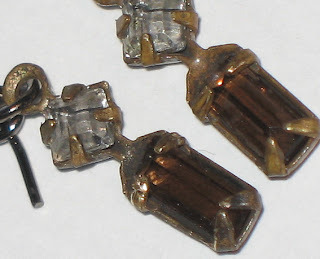 These are made with vintage bezel settings - at the top is a tiny vintage clear (diamond) cabochon, at the bottom a toffee brown slightly larger cabochon. The findings are gun metal. 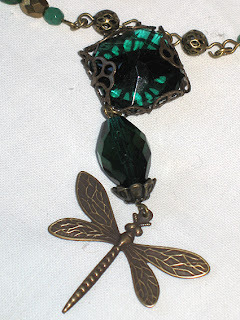 I've used the same vintage ear wires as in the Emerald Dragonfly Set with a pale white opal Swarovski bicone and more crystal Swarovski bicones hanging from vintage chain. 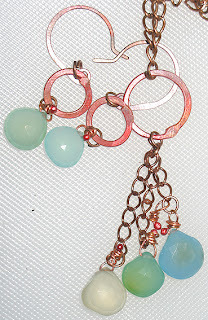 I love the fluid grace of the earrings and the lovely patina on the vintage findings. 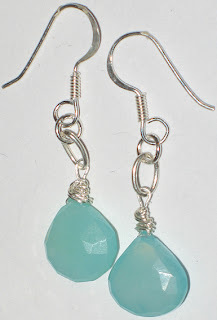 I've recently been going Chalcedony-mad. 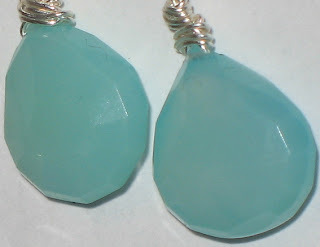 I love Chalcedony. It's a lovely semi-precious stone that comes in all sorts of wonderful colours. 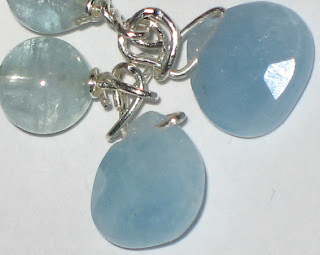 I wanted to have a matching necklace, so I used a slightly larger, onion shaped faceted Chalcedony bead, wrapped it with Sterling silver wire and hung it from two Sterling silver swirly connectors. The chain is silverplated as I didn't have a Sterling silver chain fine enough for the necklace. These were made for a friend of mine whose birthday it is today. 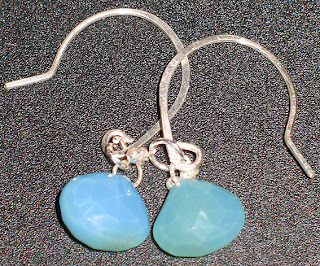 The findings are all Sterling silver and the round beads are Chrysocolla and the briolettes are Aquamarine. Watch this space. 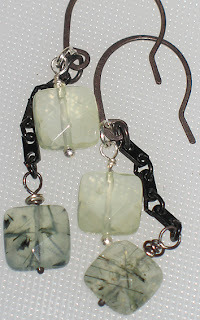 There will be more Sterling silver wire designs with semi-precious gems to come. I've recently done quite a lot of shopping on Etsy, in fact I've done most of my Christmas shopping there. I love the fact that it's the artist that gets paid rather than some shop owner and the fact that there is so much variety of everything. The necklaces below will all be available in my shop on Etsy. 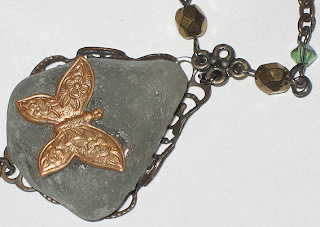 The first necklace includes a vintage butterfly charm sitting on a pale green piece of sea glass that has been wrapped in vintage brass filigree. 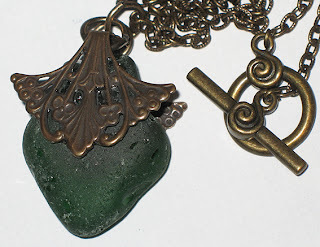 Vintage beads and cabochons are attached to the sea glass with vintage chain. 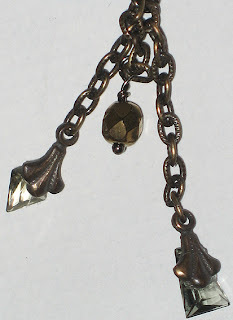 At the top of the 'pendant' is a little connector and two more vintage beads and two Erinite Swarovski beads with more vintage chain. 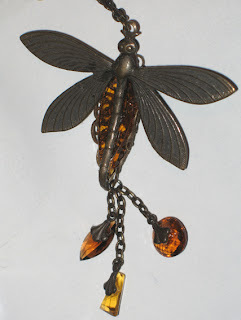 More vintage chain, a vintage dragonfly with wonderful detail, sitting on a vintage amber coloured glass cabochon encased in vintage filigree. 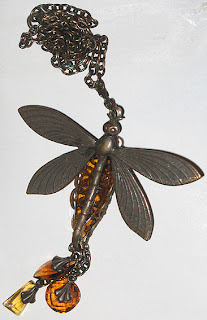 Three lovely vintage glass cabochons in varying shades of amber are attached to the dragonfly like a 'tail' with vintage chain - the same chain that has been used for the necklace. 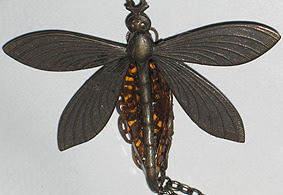 The necklace chain is quite short as the dragonfly and it's tail give it length. Sorry guys, I just love dragonflies. 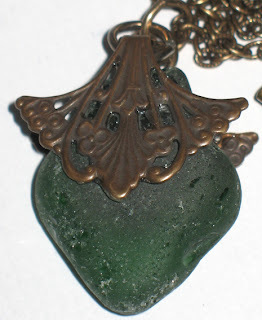 This one sits on a piece of bottle green sea glass that again (yes, you guessed right) has been encased with vintage filigree. 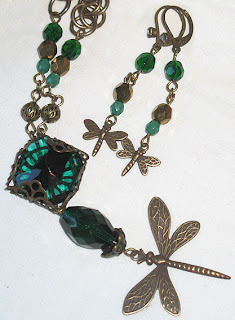 There's a tail with three vintage beads in shades of jade, peacock blue and pale green with another tiny vintage dragonfly flying after the big one. Vintage chain for the necklace, again quite short. 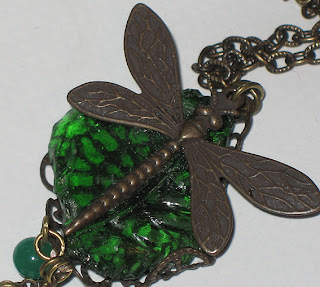 Necklace: I've encased a beautiful large vintage emerald glass cabochon in yet more wire filigree, hung a vintage bead with a lily bead cap from it and attached a medium sized dragonfly to that. At the top of the pendant there are two filigree beads followed by three faceted Czech glass beads, the golden ones are vintage. The chain (vintage) is again quite short. 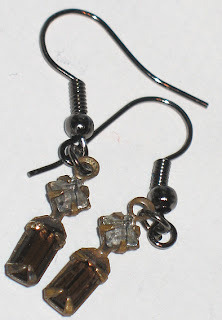 Earrings: I've used beautiful vintage ear wires that actually close at the back and have little sparkly glass gems set in a bezel at the front. 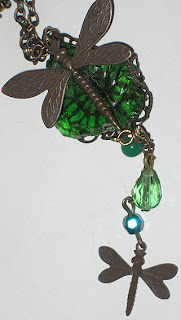 I've used the same beads as in the necklace and added two tiny dragonflies to fly from the bottom. 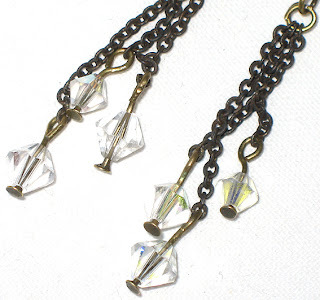 This is a very simple necklace, slightly longer than the others with vintage chain and a bit of sea glass held with a vintage filigree of a very pretty Victorian design. 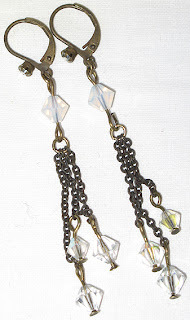 The chain is vintage, the toggle clasp new, but no less pretty for that.